"Warm fudge and peanut butter make for a sweet, scoopable cake straight from the slow cooker. 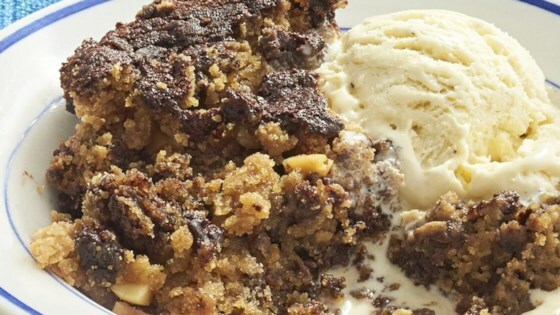 This is great served over vanilla ice cream, too!" Whisk together flour, brown sugar, baking powder, baking soda, and salt in a bowl. Whisk together peanut butter, sour cream, butter, and boiling water in a large bowl (mixture will be very thick). Stir flour mixture into peanut butter mixture until fully combined, then stir in chocolate chips. Generously coat a 6-quart oval slow cooker with cooking spray. Spread batter evenly in slow cooker. Whisk together white sugar, cocoa powder, milk, and vanilla in a small bowl until smooth. Pour over batter. Cover and cook on High until sides of cake begin to pull away from ceramic liner and appear solid (the center will still be soft), 1 1/2 to 2 hours. “Fudge cake” is an appropriate name for this recipe as it gets cakey around the sides and fudgey in the middle, which I loved! Amazing with ice cream! This cooked a lot faster than the recipe called for and was really not cake-like. I'm sorry, but it was just sort of blah to us. May have been cooked too long. It was good with ice cream. Super Rich. Lots of vanilla ice cream is a must to balance the richness. Easy to make and yummy! I think I'd make it with creamy peanut butter next time. Cooked for right about 1 1/2 hours. I may have cooked it about 5 minutes too long! Flavor was great, great with butter pecan ice cream. Good but "runny in the center"; wasn't cooked.